Includes the names: M. Walzer, Walzer Michael, Michael Walzer, Michael et al. Walzer, מיכאל וולצר, Michael Walzer et al. 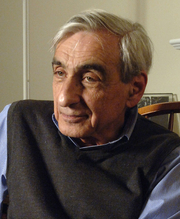 As a professor, author, editor, and lecturer, Michael Walzer has addressed a wide variety of topics in political theory and moral philosophy: political obligation, just and unjust war, nationalism and ethnicity, economic justice and the welfare state. His books (among them Just and Unjust Wars, Spheres of Justice, The Company of Critics, Thick and Thin: Moral Argument at Home and Abroad, On Toleration, and Politics and Passion) and essays have played a part in the revival of practical, issue-focused ethics and in the development of a pluralist approach to political and moral life. Walzer is a contributing editor for The New Republic and co-editor of Dissent, now in its 59th year. His articles and interviews appear frequently in the world’s foremost newspapers and journals. He is currently working on a series of lectures and then a book dealing with the successes and failures of “national liberation”--and also on the third volume of The Jewish Political Tradition, a comprehensive collaborative project focused on the history of Jewish political thought. His most recent book is In God’s Shadow: Politics in the Hebrew Bible (Yale University Press, 2012). Michael Walzer is currently considered a "single author." If one or more works are by a distinct, homonymous authors, go ahead and split the author. Michael Walzer is composed of 7 names. You can examine and separate out names.